Secluded ridge top cabin close to the Red River Gorge and the Natural Bridge. Kim’s Retreat Cabin is located on a ridge top property just ten miles from Natural Bridge and the Red River Gorge. It is the last cabin on the road. Walk across the yard to the promontory overlooking the valley. The cabin has a large dining room. The kitchen is fully furnished with a stove and oven, refrigerator, and microwave. The kitchen includes dishes, eating utensils and all pots and pans needed. It has one queen bedroom downstairs and two bedrooms upstairs. Each bedroom includes a queen bed. There is a large living room with a queen hide-a-bed couch, two rockers and gas fireplace. It also has Dish satellite TV and a DVD player.Relax on the wood swing under the covered porch or deck off the bedroom with a large hot tub. It has a charcoal grill, fire pit and large wood picnic table. 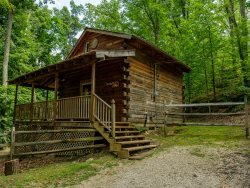 The cabin is part of Chop Chestnut Cabins, which are located up on a ridge surrounding by woods near to the Red River Gorge. These cabins offer a quiet retreat with views and wooded lots. Each cabin is uniquely designed featuring hot tubs and porches to enjoy the wooded area. A ten minute drive to the Red River Gorge makes it a great home base for a day hike through the forest or visit to the Natural Bridge area. Then return to grill out in the yard and relax in the hot tubs at these cozy cabins.